U-Fit appointments are now only $10. U-FIT is a program for students to either begin their journey to fitness or to take their current fitness to a new level. U-FIT is a wellbeing coaching service that includes 4 one-on-one sessions with your very own fit coach which includes fitness assessments and a personalized fitness program. U-Fit is offered by Health Promotion in the SRC and the SAC. To schedule your U-Fit appointment at the SRC, click here! To schedule your U-Fit appointment at the SAC, click here! A student-to-student service that will help you determine your current fitness level, develop an exercise routine for you, and coach you on how to properly follow the workout regimen created. Whether the goal is to start working out for the first time, increase your intensity level on a current exercise routine, or simply to get back in shape, FitCoaches and U-Fit volunteers are available to provide one-on-one testing and coaching! Fitness Assessments will consist of: blood pressure check, resting heart rate, height, weight, body composition profile (body fat via skinfold calipers), flexibility test, cardiovascular test, and upper body muscular endurance test. Initial appointment (to include the Fitness Questionnaire and Assessment) - Approximately 45 minutes in duration. Results & Recommendation appointment- about 1 week after initial appointment (to provide results from the assessment, along with delivering the personalized workout routine) - Approximately 45 minutes in duration. Follow-up appointment- about 6 weeks after results & recommendation (assessment is repeated to track progress and check-in with how the program is going)- Approximately 45 minutes in duration. Additional Recommendation appointment- about 1 week after Follow-up appointment (discuss results from Follow-up appointment in more detail and deliver updated personalized workout routine that is adjusted to client's progress and current goals)- Approximately 45 minutes in duration. Please note: the 4 sessions must be used within the school year they were purchased. Once the school year has ended, sessions expire. Students are encouraged to purchase the U-Fit package every year! 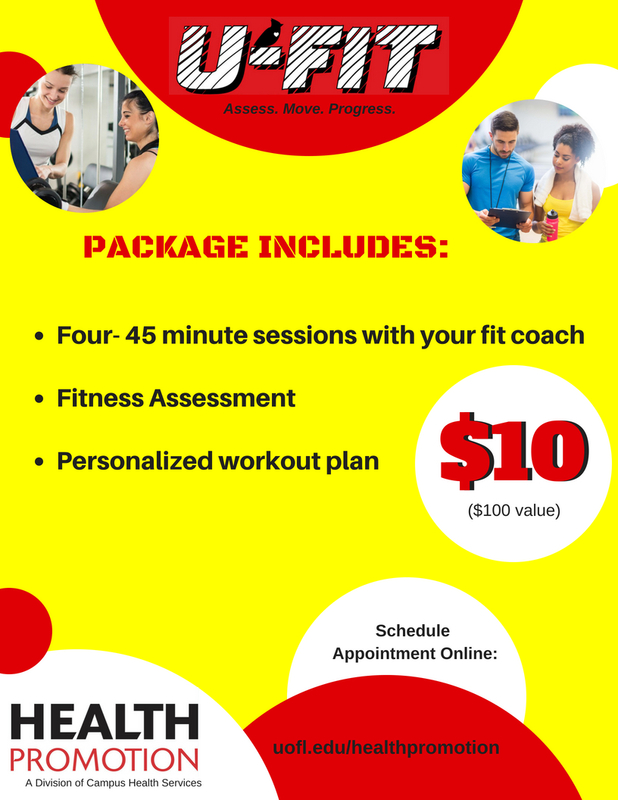 FitCoaching to help you get started, and FitAccountability to help you stay on track! Please download, print, and fill out the enrollment packet below. If the enrollment packet indicates that you need to get medical clearance, please do so using the medical clearance packet below. You will not be able to begin your U-Fit appointment without the required document(s) below. Fee: Typically gyms, personal training studios, or medical institutions charge in excess of $100 for the very same service. However, to help encourage more students to either begin or continue living a healthy lifestyle we only charge a mere $10 for this service. Exercise can be a lot more enjoyable when you are working out with others. This is a fantastic opportunity to meet like-minded people, talk about progress, and find new friends to workout with! FitSocial events vary, and will be announced to those who have participated in a FitTest & Coaching session. Note: Must have completed a "FitTest & Coaching" session to use this service. Need someone to keep you accountable? With this service, a FitCoach will keep in contact with you and make sure you're staying on track throughout the semester! Options of contact include phone, e-mail, or texting! Note: Must have completed a "U-Fit" session to use this service. There's something for everyone at the SRC! Let us help you find your fit. Schedule your personal tour today to learn about all of the services and resources you have access to in the SRC including U-Fit and chair massage! *SRC Tour is not a fitness program. It is an informative tour of the facility. Click here to schedule your personal SRC Tour!